• Combine Lemon grass, Coriander, Onion, Roasted peanuts, Sesame seeds, Chilli in the mixer/blender jar and blend it to the smooth paste and set aside. • Discard two ends of the tindora and slice them lengthwise into four. 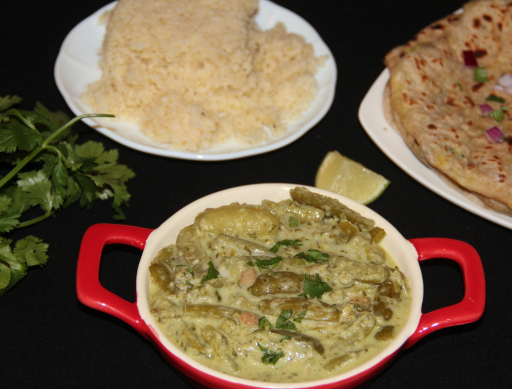 Posted on June 26, 2014, in Indian, Side dish and tagged Chitras healthy kitchen, drchdietfood, Indian healthy side dish, Indian sidedish free from spices, Ivy Gourd recipes, Low Oil Indian side dish, No spices indian sidedish, Tindora recipes. Bookmark the permalink. 14 Comments. This sounds delicious and quite simple to make. Which veggies are beneficial for a Vit B12 deficiency. That is a vegetable I have never heard of or tasted. Does it taste like bitter melon? It really sounds good, interesting that you don’t use any spices in this dish. I love creamy stews. I love Korma’s at the restaurant I go to it’s delicious, I will have to search your site to see if you have a recipe for Korma. Suzanne – these are crunchy and tastes delish….Ivy gourd is another name for this veggie..
Is there a substitute for Tindora? I am not at all familiar with that vegetable here in Europe.